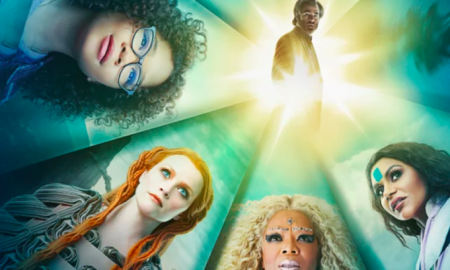 A guest post by a clergywoman who grew up with “A Wrinkle in Time” and found a disconnect between the spirituality she received from the book and now from the movie. A Geek Gospel for today! I love Madeleine L’Engle’s book, “A Wrinkle In Time.” To me it’s a story about the deep truths hidden in the world, as well as the deep love that dwells within them. Someone once said that a good story makes you cry at the love hidden in people’s lives, and when I read this book as a child, I believed that if I looked hard enough and learned enough about the universe, I might one day uncover such love in every place I looked. My kids love this book as well. When we first read it at bedtime, my Harry Potter fan was excited that one character was “calm and wise, protecting the children even when things are very scary, just like Dumbledore.” My concrete thinker was frustrated with words like thou and justified and called, asking me, “Is that supposed to be from the Bible?” My kids were thrilled by the mysterious clue that the good guys had something the bad guys did not; they could tell that truth and love were hidden in this book, and they were determined to search them out. When I took the boys to see the movie, expectations were high. I tried to prepare them (and myself) for the movie to be different from the book. I knew that, in a secular movie, director Ava DuVarnay and writer Jennifer Lee would probably remove the name of Jesus as one of Earth’s heroes (Gandhi and Frida Kahlo still make the list). I wasn’t surprised when they left out the King James Version of Romans 8; after all, my boy was probably not the only concrete thinker interested in this story. As the main character reminds us when she plays with an origami heart, you can’t always see love, but that doesn’t mean it’s gone. It’s just enfolded, waiting for you to turn things inside out. I expected the movie to change the book. I even expected it to leave out some important parts. But I didn’t expect this movie to turn the story I loved completely inside out. In case you’ve forgotten, the book tells the story of Meg, her little brother Charles Wallace and their friend Calvin traveling through the universe with three mystical creatures: Mrs. Whatsit, Mrs. Who, and Mrs. Which. The group shares the same hope: to rescue Mr. Murry, Meg’s father, a scientist who has been imprisoned on Camazotz by the Dark Thing. As they journey to different planets, the children draw closer to the Dark Thing; they feel it, then they see it shadowing Earth, then they experience the effects of its shadow on another planet. Their training missions culminate in lessons on how to conquer the darkness: remember your faults, rely on your gifts for communication across difference, do not be tempted by pride and arrogance. When they visit Camazotz, the children confront the Dark Thing in the form of IT, a disembodied brain which has eliminated all creativity in order to impose bureaucratic control. The book is a story about the triumph of light over darkness in the whole universe, as seen through the experiences of one little girl. Simple, right? Not exactly. And the movie acknowledges this: Meg’s scientist parents, for example, study quantum entanglement, the idea that subatomic particles continue to be linked even when separated by a great distance. But the children’s training missions, rather than being a careful titration of evil, become nothing more than intergalactic tourism, visits to planets replete with vibrant colors and special effects. When they arrive on Camazotz, the home of the evil IT, they discover only virtual reality, where nothing is real except for IT. In such a depiction of evil, the movie fails to grapple with the tragedy that evil flourishes most when it co-opts the flesh-and-blood existence of people’s lives. The movie thus forgets L’Engle’s most important theological lesson: evil can takes root anywhere, as long as it is offered the fertile soil of the human heart. The book I love does not flinch in the face of darkness, taking a courageous look at what it means to love like Jesus. For L’Engle, love is strong as death, but love costs – it involves self-sacrifice, courage, strength. This costly love shines through all of the characters; Mrs. Whatsit, for example, a star that threw itself into the Dark Thing so that the world might have more light. Mr. Murry and Calvin try repeatedly to battle evil so that Meg won’t have to, dissolving her uncertainty about her mission in the face of their self-giving love. When she confronts evil to save her brother, over and over she repeats, “I love you,” reminding us that only this personal, tender rhythm is enough to collapse a totalitarian regime. The movie waters down this theology. Mrs. Whatsit refers only to her youthful beauty as a heavenly being, not her sacrifice for the greater good. When Meg stays on Camazotz to confront evil, her father wiggles away, and nobody else volunteers to go, making Meg somehow the only heroine. Rather than learning to love those who are difficult, Meg’s journey culminates in her exclaiming to Charles Wallace, “You should love me. Because I deserve to be loved!” When she returns to her neighborhood, Meg becomes kinder to difficult people, but this newfound self-esteem seems not to come from any force that was greater than herself; it was just a choice she decided to make. I’m not sure why the movie left me feeling so empty inside. But I suspect it has something to do with a script that was hollowed out of hard truths in order to sell more tickets. Why do I suspect this? Because that’s exactly what happens to me with the church. I’m not speaking of the times that the church forgets to say the word “Jesus” or doesn’t quote enough Scripture (although these times are also worthy of further conversation). Like the movie, the church also leaves me indifferent by turning the complex into something simple-minded, by sometimes making a well-rounded tradition feel as flat as the two-dimensional planet Meg lands on at the beginning of the book, a place so limited that it feels impossible even to take a deep breath. When the church tries to become more marketable, we proclaim nothing more than one generic God who wants to help us, who wants us to remember to be good people, so we can go to heaven. It’s not a bad start. But it’s also not what it means to follow the Way of Jesus. There’s truth in this kind of moral therapeutic deism, in the Wrinkle in Time movie too: love helps us be good people, we should all be able to love ourselves as we are. But without a Source of Love from which to draw? Without something to say during the times when the universe doesn’t seem so benevolent, when good people do evil things, when loving your enemy might mean losing your life in order to find it? These are easy truths, full of sound and fury, signifying nothing. If the church resorts to smoothing out all of its rough edges, then we will have become everything our critics name: an opiate for the masses, a pretty fairy tale, an antiquated bureaucracy. And there’s a reason L’Engle defined this kind of bland bureaucracy as the face of ultimate evil; it erases everything creative about who God has called us to be. In the church, we call for “in essentials, unity; in non-essentials, liberty; in all things, charity.” But sometimes we can’t articulate our essentials until somebody takes them away. For me watching this movie has forced me to my own “essentials” – what are they, why do they matter so much, and how can I talk about them in a way somebody else can hear? And so it is with the church: if certain theological words and Scriptures no longer communicate, how do we clearly tell the story of our essentials with passion, without watering anything down, to a world that is hungry for stories? Telling the right story matters. If the church is truly to transform the world, we need to tell more stories about self-giving love and fewer about how to just be nice. We must acknowledge that choosing messier stories comes at a cost, that niceness will always sell more movie tickets and get more people in the pews. But if we can choose to tell the difficult story? We will begin to pierce pinpricks of light into the darkness which covers our planet and shadows our hearts. We will have become a beam of light shining through this dark and stormy night. And we will have become a people who don’t need to throw around the word Jesus or words from Romans 8 in order to tell a story about the search for the costly, life-saving, tear-stained love which is hidden in each and every one of our lives. Rather than enter the fierce debate about the source of this quotation, I will trust in the world of the fictional universe and hope that someday, Mrs. Who will sort it all out. Rev. Meredith Dodd is a United Methodist pastor and a writer who tries to remember that Madeleine L’Engle was rejected twenty-six times before she found a publisher. She lives in the Pacific Northwest with her three sons, who improve both her preaching and her writing with their relentless, yet affectionate, feedback. Meredith, I was going to write my own review of “A Wrinkle in Time,” but you’ve said so beautifully what I wanted to say that, with your permission, I’m going to repost your essay on United Methodist Insight. If I were to sum up my feelings about the movie versus the book, I would have to say that the movie lacks the book’s transcendence. FYI I had the great good fortune to meet Madeleine L’Engle in 1994 at an Associated Church Press convention. She was the keynote speaker and it was a thrill to hear her expound upon writing and theology for a couple of days. Best of luck with your own writing! You have my permission. Thanks, Cynthia! As some commenters have pointed out, my review does not address issues of race and representation that this movie raises. I would also encourage UM Insight to look for African-American reviewers who can speak to those topics with more wisdom that I can. Thanks for that suggestion, Meredith. I’ll be on the lookout! Just like some modern Christian worship services, the movie was long on glittery spectacle and woefully short on moving, meaningful story. I did appreciate the racial diversity of the cast, however. But otherwise I thought the movie was a huge waste of 100 million dollars and a huge wasted opportunity to make a brilliant movie. Such a good review (not merely of the movie!) a mentor of mine once told me after sitting through a conference on “worship” that if worship makes you think being a disciple of Jesus is easy then you’re doing it wrong 🙂 thanks for your words and thoughts my friend! Never read the book growing up. I’d like to take my 6-year-old daughter. Will she enjoy it? I am a Creator. I’ll Improvise.